Small - $9.99 Medium - $9.99 Only 6 left! When you are part of an alliance of skilled smugglers, mavericks, and mutineers, you need to work pretty hard to stand out as the most rebellious. According to her Imperial criminal record, Jyn has plenty of experience with forgery, possessing stolen property, aggravated assault, and resisting arrest, which are exactly the kinds of colorful talents needed to pull off a dangerous heist. But the Empire isn't going to let anyone just walk in and take the plans for their shiny new Death Star, so this crafty freedom fighter is going to need to use every trick she knows to succeed. If you're feeling a little roguish yourself, this detailed deluxe costume is the perfect look for your Halloween celebrations! 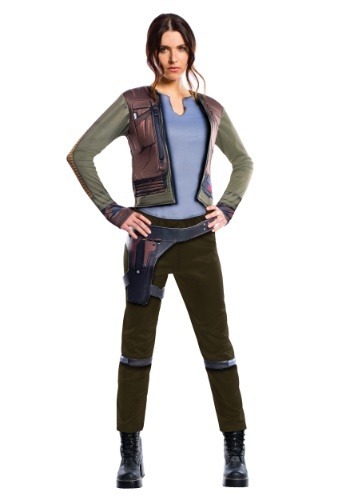 It captures the look of Jyn's practical and simple outfit, which is just the kind of style you want on a covert op. The polyester top features an attached padded vest with stitched details, looking both casual and tough at the same time, and the included olive pants and printed polyfoam gun belt make you look ready for action. Whether you're going solo or assembling a team of fellow agents in our other awesome Rogue One costumes, the Alliance has a fighting chance with Rebels like you on their side! It’s a little sad that this is the “deluxe” version. I really wish the shirt and jacket were separate, and the thigh holster is awful. I’ll be using it as a starting point to build out a cosplay from. I’m just glad I paid so little for it. The holster it should at list functional, is only a painting, I supose that you sell a jyn gun someday.